After an hour’s drive from Kuala Lumpur, we reached Bentong town. Since the time was around 10:30 am, wife suggested we had some ice-cream first before visiting the famous Chamang Waterfall. I agreed as it would be out of the way if we went to the waterfall first as it is located after Bentong town. 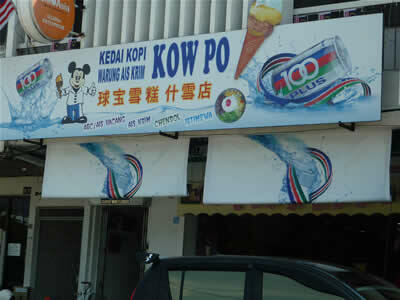 It was not hard to locate Kow Po Coffee Shop. If you overshoot, like we did, you can always make a U-turn by making a round trip around Bentong town. The talk-about shop is located directly opposite Hentian Raya Bentong (Bentong Bus Station) and next to Hong Leong Bank. We were greeted by a super-friendly old man, who turned out to be the owner of the shop. Since the shop was just opened, there were only a couple of customers there. After checking what they offered, I settled for cendol (topped with one scoop of ice-cream). The rest of the gang decided to go for their famous homemade ice-cream. You can choose from a range of different flavors. We wanted to try the durian flavor but somehow it slipped our mind when we ordered. How’s the ice-cream? To me, nothing extraordinary but I find it smoother, finer, and less sweet compared to what we can get from a local grocery shop. The price is not the cheapest but worth a try. And the service is excellent especially when you are served by the owner himself. 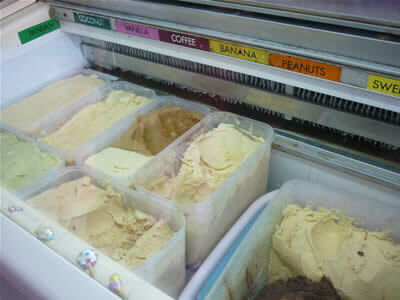 Ice-cream: one scoop costs RM3.00 while with cone is RM2.50. 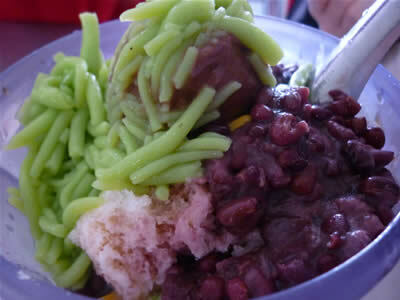 Cendol is from RM3.00 onwards depending on the combination you order. Besides ice-cream, yong tau fu is also available. Opens daily from 10am – 7pm. Closes on alternate Mondays. Note: This is the 1st article of A Family Road Trip to Pahang: Bentong, Raub, and Kuala Lipis series.